The amount of applications that have been developed over the past several years since the technology boom as turned into the application boom is increasing daily. It is hard to grasp how many apps are actually out there that can actually help the small business owner, but the truth is, there are many. 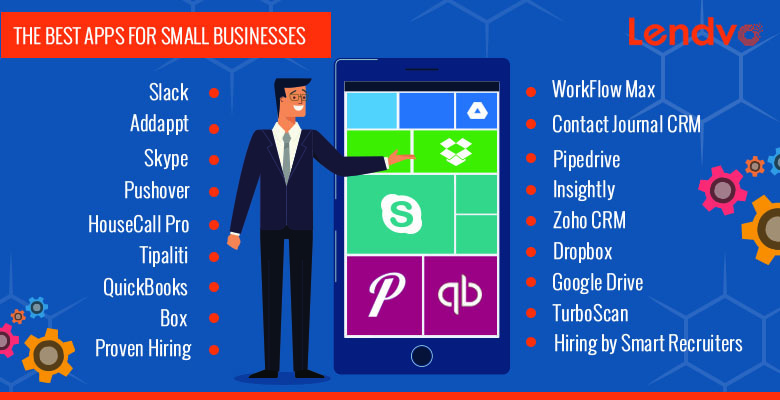 We have done some research here at Lendvo and put together a list of the apps we think are most helpful to small business owners. We have broken down the essential apps for small businesses into the categories we believe hey fit best within. The first thing that comes to mind when running a successful business is communication. Internal communication and communication with the partners of your small business are both essential factors that will make or break your success. Let’s start by reviewing some of the best communication apps that many successful entrepreneurs and small business owners swear by. Slack was created with the intention of bringing all communication lines that a business deals with on a daily basis to the same place. Their open channels method allows for teams to organize heir conversations in open channels such as, creating a channel for a project, new topic your business is discussing or specific team within the business to review sensitive information; the channels can be open to as few or as many team members as desired. Their direct messaging platform allows messages to be sent from one person to another or to a smaller group of more people to discuss a given project. The calls option allows for users to have Slack voice or video calls in any of the open channels, also allowing you to share your screen simultaneously. Additionally you can share, drop and share files, images, PDFs, documents and spreadsheets. This amazing app is available on iOS and Android. Forgot something? All items on Slack are immediately searchable. Try it for free and upgrade to a paid plan for $8 per month for each user. Users say nearly 50% fewer internal emails were sent out and about 25% fewer meetings were held at their business proving an increasing level of productivity. Addapt was created to make it easier to communicate with business associates. By using the application, you can organize your contacts into groups and send messages through the app. You also have the ability to update the contact information in your address book of business associates, friends and family. The Group Actions feature allows you to email, text or send an unlimited number of photos via email to groups privately. Your friends can also update their contact information, special fonts and emojis in your address book privately. You can do the same in theirs and you can even send each other smart favorite cards. Skype has been around for a long time and is probably the pioneer of communication apps. There is a reason apps stay around for this long as most, do indeed, fade into the dust. Skype is most popular as an app for its videoconferencing services. The most basic version of Skybe for Business has a starting rate of $5 per user for each month. Skype allows you to have online video conferences and calls with up to 250 people and it is free to download initially. You can also transfer photos and files of all sizes, share your computer screens and call groups of up to 25 people while sending text messages. Additionally, meeting recordings will be available after your meeting is completed if your team needs to review any bullet points of what happened in the meeting that were not written down. It is available on iOS, Android and Windows, including most of the new tablets out there. Pushover is a great app for the overly busy entrepreneur and small business owner. It’s main goal is to make it easy to get real-time notifications on all your devices, including iPad, Android, iPhone, and Desktop which include Pebble, Android Wear, and Apple watch. What Pushover does is integrate all your devices with what is occurring in the applications so you can receive the notifications of the applications immediately. Their latest update was in late 2016 for Pushover for iOS which is a new feature called Glances API that allows the user to see even details from their alarm system that a garage door is open or allows you to send small amounts of data at various times throughout the day. Financing and Accounting are the next category where we will talk about some essential applications that can help your accountant or even help you from spending money on an accountant in the first place. After all, if you don’t know where your money is, the communication applications will prove useless to you! QuickBooks is the first application that comes to mind when thinking about accounting. QuickBooks helps you to keep all of the finances of your business in one place with its state-of-the-art technology. Starting out as a website, QuickBooks has seamlessly and efficiently adapted to the technological transformation of financial applications. Even by just using the application, small business owners and users of QuickBooks are now able to run their business by viewing financial statements, including profit-and-loss statements, track unpaid invoices and pay their employees just through the application. The app connects to iOS and Android devices with rates beginning at $10 for the firs six months and $13 for the next six months. The initial 30-day trial is free and the fact that you can connect to Square, for anyone selling items in person or any PayPal or credit cards accounts makes the investment well worth it in the long run. You are also able to track receipts and expenses with photos. Tipalti has created an application that makes Accounts Payable not the most dreary part of your day. Tipalti takes the manual processes out of the Accounts Payable process by allowing by allowing payments to happen in real time with the integration of payment results into ERP solutions like NetSuite for example. This makes cross-region payments and reconciliation reporting seamless. Fraud prevention services and AP regulatory compliance are other features Tipalti offers. He portal also allows your vendors to update their own contact, payment and tax information directly. Payment status notifications are automatically sent via branded emails to clients and vendors. Tax forms are also collectible through Tipalti. They consider themselves responsible for cutting out 80% of the workload that small businesses face in the Accounts Payable category and there is reason to believe this is true. HouseCall Pro is the most highly rated field service business in the industry. It is affordable and helps to get your service business organized including, but not limited to scheduling, dispatching, invoicing, payment processing and more. They pride themselves on being able to do the work of a company like QuickBooks by allowing you to enter paper invoices on the go while also having the ability to confirm appointments for the next day through the app. Employee permissions allow your employees to be notified when they are put on a job. They will be advised of the time their job is scheduled for. Additionally, you can manage all your payments with invoices and receipts through their seamless payment processing tab. Text message updates are available on top of the online booking. HouseCall Prop is extremely highly rated and used by a lot of players in the tech game including Yelp, American Key Supply, Germaine Distributors and more. Contact Journal CRM is a small business app that allows you to keep records of conversations you have had in the past, create followups for meetings in the future and customize your contacts information with any fields you deem necessary to attribute to them. Additionally, through the app, you can link important documents that you are working on with your contacts, or even if a project is on hold, you can link a given document to them so when you come back to the project you know what you are working on. The app is available on iPhone, iPad and Mac. You can also keep notes on meetings and all communications had so you are fully prepared for the meeting you will have next with this given contact, which you can plan on Contact Journal CRM. The App also creates a grid of all your contacts’ addresses, even tracking the distance to the locationw here you are. You can color-code your contacts and choose for different routes to better plan drives to meetings or uber rides. The app also is available to sync with Dropbox and will sync automatically with all iCloud applications, even when offline. Even more, you can create groups and reporting by exporting data over email or CSV files. Rates range up to $39.00 per month. Pipedrive is a well known application in the CRM space because of its unique technology that makes it a leading sales management tool in the industry. They pride themselves on being easy to use for small sales teams, as well as some large. Initial sign-up is free. You can plan all activities and future actions so you do not fail to miss a meeting or a follow-up. Additionall Pipedrive will help you to manage your deals, creating grids on where you are on each deal and what you can do to help the deals move forward strategically. While your deals are going on, you can also track everything going on within the deals including, but not limited to, the conversations you are having with other players in the deal. Your sales will be seamlessly organized on Pipedrive, allowing you to keep your sales game fully in tact. Pipedrive’s software is extremely complex, but 9 out of 10 people say that Pipedrive is actually enjoyable to use because of its simple interface and usability. There are currently over 50,000 users of the application. Pipedrive billing is $10 for silver per month, $24 per gold and $63 per premium, the latter two giving you a full email sync and the rest offering variations on full sales, management and features. Insightly is a widely used and respected CRM application that allows for seamless project management while protecting your business information with SOC 2 compliance and SSL encryption. Their integration systems brings your small business important features into one place, including calendars, email, files and notes. The Insightly app is a partner of Google, Outlook, DropBox, Evernote and many other apps. They offer a free trial that allows you to use the advanced features of the application if you were to become a meber. Their customer relationship management supports lead management, contact management with extremely fast, high-technology based file sharing, fast search, custom fields and filters, mass email templates and web to lead and lead to web contact allowing you the capabilities of growing your business through the app. The project management space allows you to view task and event reports, group all files associated with any particular project with that project, receive automatic email reminders and create milestones and pipelines for given tasks and projects. Additionally you can manage potential business through the sales funnel, create opportunities, assess potential value and assess the health of your business. Users have also found the social media integration to be seamless as you can explore any contact of yours’ public information from the main social media Apps: Facebook, Linkedin, Twitter. On the pricier side, but for a reason, Insightly is highly recommended with fees of $12, $29, $49 to $99 based on the level of CRM your business is seeking. Zoho CRM is a highly acclaimed CRM application for small business owners because it regularly undergoes major upgrades to for its mobile applications and UI capabilities. The free edition is available to all customers and due to its unique interface, it easy easy to learn and use for the most or least tech-savvy small to medium-size business owners out there. Zoho CRM is cloud-based and the app allows you to track leads, increase your sales profitability and even predict the future behavior of customers. Zoho CRM has impressive proven success rates including 23% decreased sales and marketing costs, 24% decreased sales cyles, 300% improvements in lead ocnversion rates, 41% revenue increase per sales per person and 27% improval in customer retention to name a few. They do a great job of taking the monotony of the sales process out of the sales process itself. The streamlining of the sales process and easy-to-use interface make Zoho one of the most reputable CRM small business solutions in the game and we highly recommend them. There are currently over 50,000 customers using Zoho CRM. Zoho is fully customizable and you can use it for whatever best suits your company’s needs including using it with Google Apps, WordPress, Mailchimp and Unbounce amongst other widely used applications becoming their partners recently. Their social media technology is also widely competitive with all other CRM apps as they even let you know when anyone interacts with your brand. Some of the apps we have discussed so far deal with documents, but there are some specific apps that just focus on documents, including simply signing, sharing and interacting with documetns with your team, business partners, clients, attorneys and whoever else your small business is dealing with on a daily basis. Dropbox is arguably the most popular document sharing application and many business claim it centralizes their documents, videos and other files. It is a one-stop-shop for users to share and store photos, documents (including Microsoft Word documents, Excel and Adobe PDFs) and photos. You can share documents with other users even if they do not have dropbox. You can access slides for powerpoint documents and work on them together through the app, same goes for the word and excel documents. Dropbox is arguably the best document sharing and storage app for small businesses with blans coming in at $0.99 for 20GB of storage, $3.99 for 200GB of storage, $9.99 for 500GB of storage, $1.99 for 100GB of storage and free for 15GB of storage. If you are not doing extensive work involving CRM and just solely working on documents, Dropbox is a great option for any and all small businesses. Google Drive is a great application that keeps on improving (this is Google we are talking about). This is a safe and secure application where you can store files and folders for those files including Excel, Adobe, Microsoft word documents and Google photos. You can give access to people you want to be able to work on a particular document from your team, or even give team members access withou tallowing them to edit the actual documents. Content is quickly and easily viewable, allowing you to see file details and activity and easily search for any documents you may need. The documents are all backed up and saved to Drive so you do not have to worry about losing them. With that being said, the truth is that Drive may not be the best platform when compared to those like Dropbox and Drive, but it is free and we believe improvements will be made in the near future to Google’s document sharing platform. Box is another file sharing platform that allows you to view, share and edit documents securely on their website and in the application. Encryption and key management software used by Box are state-of-the-art and their user template is sleek and easy to use. Box is in international date sharing platform with storage of customer date in Europe, Asia and Australia. Files are viewable in over 120 formats throug the Box app, allowing you to save files, access them online and capture content faster than most apps in the business by sending photos and videos from your iPhone or iPad right to Box. In-depth document statistics and reporting are available for Box users including managing user permissions and ensuring files are not being accessed by unauthorized users. Box also allows you to organize project files, conversations and deadline allowing your team to focus on what is important when they’re working and not deal with the tedious tasks. They are partnered with many other top apps including Office 365, Slack, Google Documents, SalesForce, NetSuite, DocuSign and thousands of others. Box offers a free plan with 10GB of storage and a 250MB file upload unit then a plan at $10 per month of 100GB storage and with a 5GB file upload limit per user. TurboScan is a great app for all small business owners. It allows you to turn your device, iOs or Android, into a full-feature scanner for documents, receipts, whiteboard brainstorming sessions, notes, phots and other texts including quicksly scanning documents of any shape or size and sending them as PDFs or JPEGs. TurboScan works to send documents through your usual emailing methodology on your device, but does not send them directly; this would undoubtedly be a good feature, but the fact that it does not do this allows for a more favorable price. The AirDrop function in TurboScan is available when you click “Open PDF in” within the app. A great feature is that you can add pages to scans you have already made. The app goes for $4.99 and allows you to edit, store and send documents you scan through TurboScan anywhere. Hired is a highly regarded hiring application that allows employers to connect with potential employees. The app mostly focuses on employees in the tech and sales sectors. The user interface offers employers the opportunity to see a profile of the talent they are looking at including a picture, their current location, a resume and their specific talents so the employer can see if they may be a good fit for their team. They actually use an algorithm to better understand candidates and cater a handful of client profiles to be delivered to your inbox daily or weekly as you wish. Usually, it takes 25 days to hire, cutting your sales cycle in half and candidates are used to a 95% response rate. You also do not have to pay until you make a hire and you are allowed unlimited hires for a monthly flat rate. Proven Hiring is another majoy player in the job hiring application world. Nearly 90% of job seekers begin their job search on their phone and most apply to jobs directly on their phone. Proven Hiring is constantly approving their application and they are responsible for combining over 15 of the top job boards including Indeed, SimplyHired, Monster, Craigslist and more. The app supports hiring managers from the initial sign-up stage to the final stages of the hiring process. Prices begin at $24.99. You can also track how your job listing is doing, review applicants and contact candidates through the site. Hiring by Smart Recruiters is one of the top rated job apps on the market allowing SmartRecruiter customers to assess candidates, manage and respond to applications in real-time. HR intel can see potential candidates profile in a user interface that is pleasing to the eye listing the candidate’s last three jobs, their picture, current job and location while also giving you the opportunity to message, call, reject or review a potential applicant. The rest of the app is equally as easy to use and we highly recommend it.